So that’s what you lot like, is it? The tree of life should be a garden. With bushes. Biologists like to talk of and depict, “the” tree of life. This is shown here as in most places, with a bacterial and an archaeal bifurcation coming off a LUCA base, and then another bifurcation of archaea into modern archaea and eukaryotes. Of course, there are also the anastomoses: an early intracellular colonisation of a eukaryote ancestor by a bacterium, which gave rise to mitochondria, and then another later event, where a cyanobacterium became chloroplasts in the ancestor of green plants and algae. What is not generally appreciated is that the latter occurred more than once – with different photosynthetic bacteria providing distinctly different types of chloroplasts in the various lineages of algae, The situation then becomes more complicated, with minor and more complex anastomoses among eukarya, with unicellular eukaryotic algae becoming intracellular symbionts and then complex organelles – with evidence in some cases that this happened more than once, as evidenced by multiple layers of membranes surrounding chloroplasts in photosynthetic organisms whose closest relatives are non-photosynthetic. Thus,”the” Tree of Life already has some internal interconnections that make parts of it more a reticulated network than a bifurcating tree – but this complication pales into insignificance when one takes into account the fact that “the” Tree does not take into account the wildly bushy garden of shrubs that would be viruses. A good-natured exchange followed, which prompted the writing of this post – because, really, the Tree of Life SHOULD be a Garden of Life, with one tree and a collection of distinct bushes, some pretty big, representing different virus lineages. The biggest bushes would probably be the so-called megaviruses, and collections of viruses dignified by being grouped into taxonomic Orders, such as the tailed phages in the order Caudovirales and the ssRNA(-) viruses grouped as Mononegavirales. And of course, some components of those bushes meet up with some of the roots of the tree – in the form of specific genes like DNA polymerases, which may well have a common origin with cellular genes. Some of those bushes also inerconnect underground, like some of the reverse transcriptase-dependent viruses which have nothing else in common; the RNA viruses which share RNA-dependent RNA pol enzymes, but with other components from different origins – the okapi-like viruses, as they were termed by Rob Goldbach. Some bushes in fact parasitise the tree, just like parasitic plants grow on other plants: the polydnaviruses of wasps, for example, are effectively genome components, and are used by their hosts to aid in parasitising their target hosts. So, a garden – and one that it would be challenging to portray. That’s right: a new header graphic after lo, these many years. Something old: Maize streak virus, in all its geminate glory, on the left. Picture taken by RG (Bob) Milne in Cape Town, 1978. Something new: unidentified phycodnaviruses, middle right. Picture by Hendrik Els, 2015. Something borrowed: T4-like phage particles, right. Picture by Mohammed Jaffer, 2005. Something blue: Bluetongue orbivirus particles, centre left. Picture by Ayesha Mohamed, 2015. On behalf of the Institute of Infectious Disease and Molecular Medicine of the University of Cape Town and the Poliomyelitis Research Foundation, we are pleased to invite you to Virology Africa 2015 at the Cape Town Waterfront. The conference will run from Tuesday 1st – Thursday 3rd December 2015. The conference venue is the Radisson Blu Hotel with a magnificent view of the ocean. The hotel school next door will host the cocktail party on the Monday night 30th November and in keeping with Virology Africa tradition, the dinner venue is the Two Oceans Aquarium. The ACADEMIC PROGRAMME will include plenary-type presentations from internationally recognised speakers. We wish to emphasise that this is intended as a general virology conference – which means we will welcome plant, human, animal and bacterial virology contributions. The venue will allow for parallel workshops of oral presentations. There will also be poster sessions. Senior students will be encouraged to present their research. We have sponsorship for students to attend the meeting and details will be announced later in the year. Our preliminary programme includes two workshops. There is a hands-on workshop on “Plant cell packs for transient expression: Innovating the field of molecular biopharming”, with the contact person being Dr Inga Hitzeroth – Inga.Hitzeroth@uct.ac.za. This workshop will run at UCT one day before the conference, 30th November, and a second day, 4th December, after the conference. The second workshop is on “”Viromics for virus discovery and viral community analysis”. The workshop at UCT will be on 4 and 5 December with the contact person being Dr Tracy Meiring – tracy.meiring@uct.ac.za. Some of the workshop presenters will be integrated into the conference programme but the practical components will be run at University of Cape Town. Separate applications are necessary for each workshop. Anna-Lise Williamson or Ed Rybicki. 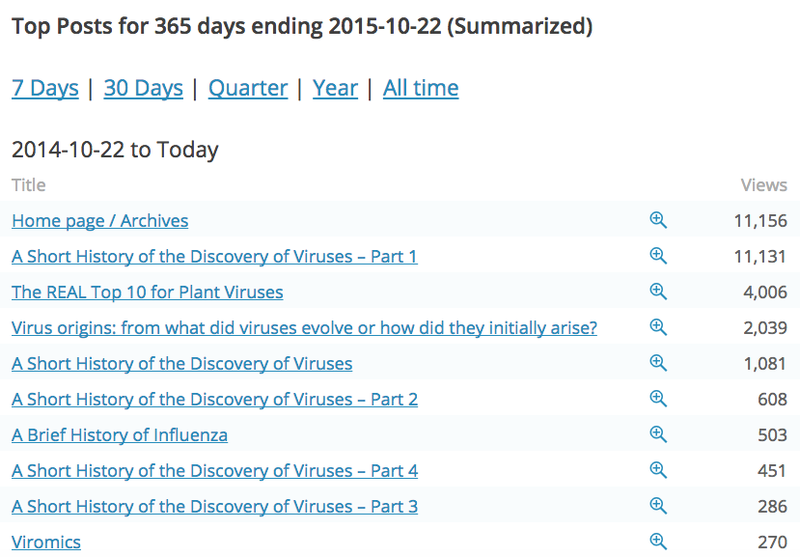 How should we preserve old viruses? 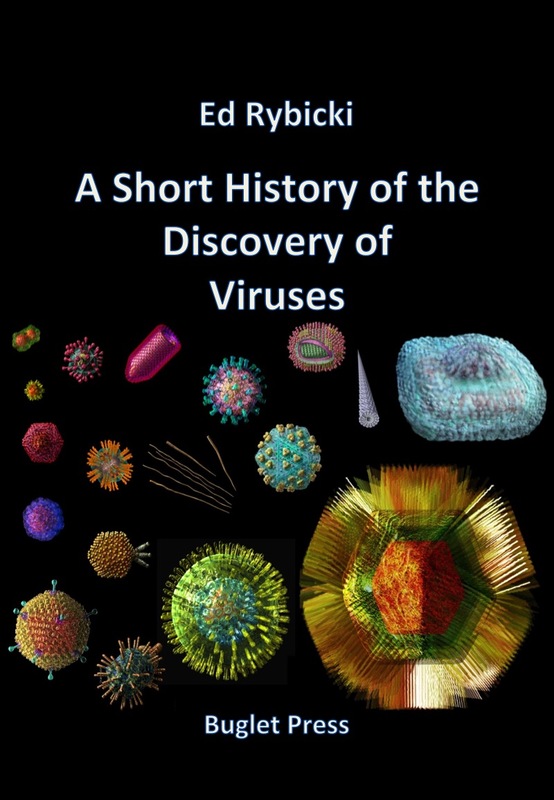 I was reminded via Twitter by Vincent Racaniello, he of “virology blog” fame, of the problem of preserving stocks of old viruses. Particularly, in his case, of stocks of a virus that may be eradicated in the wild in a few years, and then – according to him – will need to be destroyed. Surely we need to at least preserve sequence information of these pathogens before we let them go into oblivion, the way variola and rinderpest viruses have already gone? “Great that you have preserved these samples – but a longer-term strategy needs to be adopted, before completely irreplaceable specimens are lost forever, to you and to science in general. I have the same problem: a colleagues’ samples of plant viruses; beautifully preserved in heat-sealed glass vials, dried over silica gel, dating back in some cases to the early 1960s. 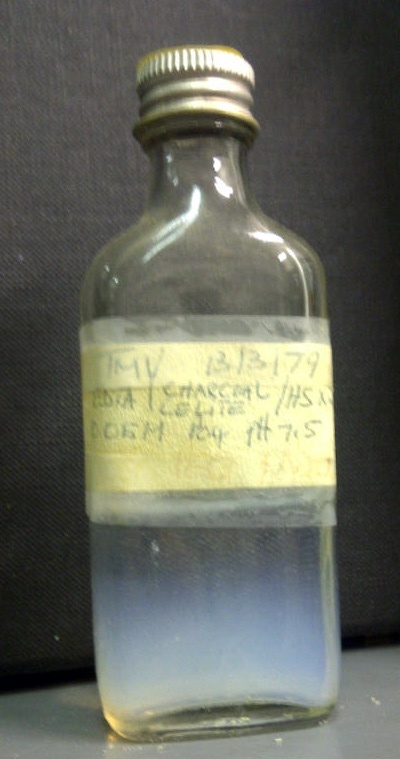 For that matter, I have about a thousand glass bottles of liquid plant virus samples at 4degC, dating back in some cases over 40 years – and still viable. Surely there is a case to be made for preserving some of these viruses? Mining them for sequence in this metagenomic age is not that difficult; preserving their infectivity, however – another matter. Some of my plant viruses are probably bomb-proof; your poliovirus samples, on the other hand – probably slowly deteriorating as we watch. A wider conversation is needed: I know of other archives, of old poxvirus collections for example, that will be lost forever in a few years. Should we not get an international effort going to log them, sequence them, preserve them? If any of you out there have a similar problem, let’s hear from you – and maybe we can do something to at least preserve the genetic information in unique collections. I would like to test the response to a Introduction to Virology ebook that I want to develop from my extant Web-based material, given that this is likely to disappear soon with our Web renewal project here at UCT. 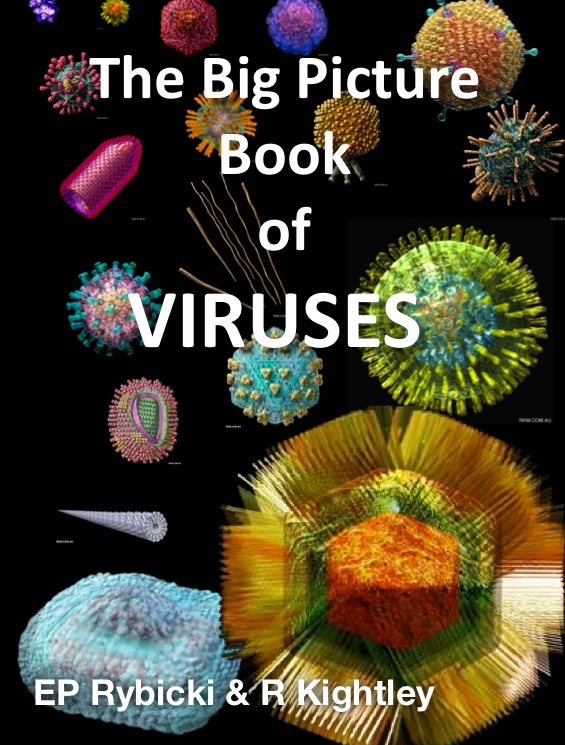 Download the Virus Picture Book excerpt here. And then please tell me what you think / whether you would buy one (projected price US$15 – 20)? Ta! So nearly 100 years after Felix d’Herelle started championing phage therapy, the West is finally taking notice? I’t actually way past time that they were taken seriously: the Eliava Institute in Georgia has nearly that long a history (d’Herelle influenced the founder to start their enormous collection of phages) of successful treatment of bacterial infections, but westerners have stayed wedded to increasingly ineffective antibiotics for the last 70-something years. I know what I might work on in my old age…. Copyright Edward P Rybicki and Russell Kightley, February and March 2015, except where otherwise noted.